As described in my previous post, a few months ago I spent an evening meeting brewers from the Scottish Highlands, learning about the market challenges they face – and tasting some of their beers. Cairngorm Brewery will already be familiar to many both north and south of the border, partly because of the array of awards on its wall, most of them for its Trade Winds golden ale and its gorgeous Black Gold stout, but also because it has participated in several of JD Wetherspoon’s national real ale festivals. As many brewers will admit, while there’s no financial profit for them in these festivals, they're a great publicity boost. Supplying real ale across the country is a major task, said Cairngorm's Merlin Sandbach, not least because it means having 400 or 500 casks to fill. Two factors make it practicable – one is that Wetherspoon has its own distribution centres, and the other is that you can now rent casks for one-way use, with the rental company recovering and cleaning them afterwards. 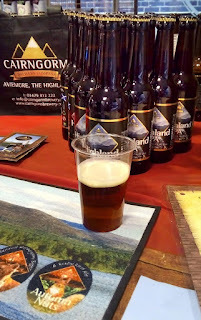 As well as its mainstays, at this festival Cairngorm was offering its bottled Highland IPA. This was an interesting Scottish take on an old friend, with lots of toasty caramel adding to the citrus hops, herbal bitterness and malt that you’d expect. Confusingly, there were two new microbrewers present from the Speyside area – Speyside Craft Brewery, and Spey Valley Brewery. “We do cask, kegs and bottles. That was a no-brainer, there was no reason to limit ourselves,” said Speyside’s Seb Jones. “It's predominantly a local market, we do definitely get seasonal influences though,” with local craft beer proving popular with the many summer visitors to the area. A former home-brewer, he joined the oil & gas industry “but didn't enjoy it much, so I moved back. The brewery took 18 months of planning and fund-raising. It was just me at the start, now there's six of us, including a head brewer.” He added, “The beer range is what I want to drink – how else can you be passionate about it?” How else indeed! I tasted his Findhorn IPA and Bottlenose Bitter – both were good, the former having notes of bitter orange and burnt caramel while the latter, named for the dolphins that live nearby in the Moray Firth (I've seen them), was dry-sweet and lightly bitter. 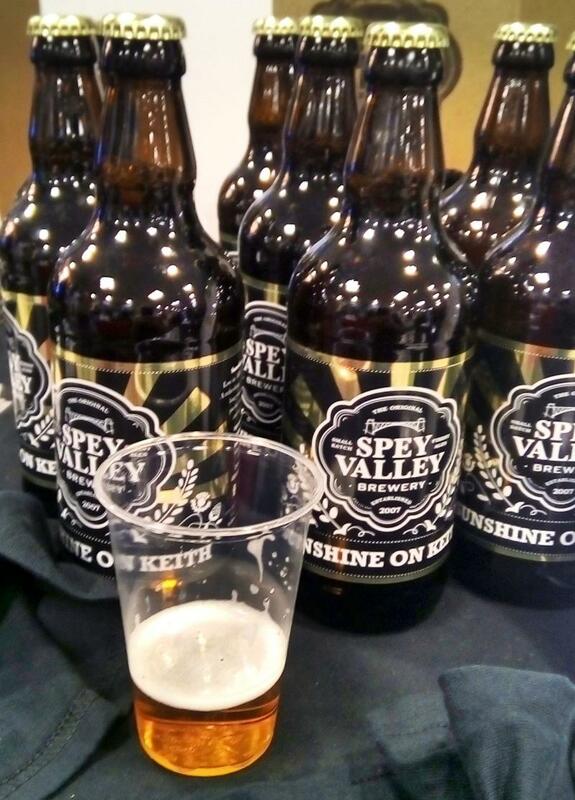 Of course, beer isn’t what the Speyside area is best known for, so it wasn’t too surprising to learn that the founder of Spey Valley Brewery, David MacDonald, originally worked in the whisky business as a distiller at Cardhu (now part of Diageo). Of course, every whisky distillery is also a brewery, although they don’t make this obvious, because fermented but unhopped ale is what they distill. He initially put together a 200 litre brewkit more as a hobby, but was looking to expand when he met local farmer and hotelier Innes MacPherson, now his partner in Spey Valley. “He wanted a 10-barrel plant,” said Innes. “The window of [craft beer] opportunity was closing fast though, and when we priced it a 20-barrel was as cheap, and the opportunity meant capacity was needed.” So David has retired from Diageo and gone into brewing full-time. His smoky and berryish Spey Stout is a tasty mainstay, but I also tried the eponymous David’s Not So Bitter, a well-balanced light bitter. 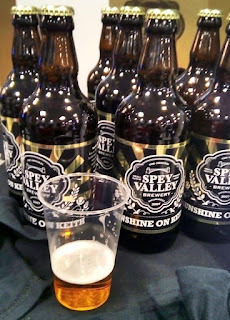 To add a little more confusion, Spey Valley, via its floral and crisp Sunshine on Keith blond ale – although I see they’re now more fashionably calling it a Session IPA – also overlapped with the next brewer along, Keith Brewery. A little name-sharing shouldn’t surprise though, given that Keith is one of the main towns on Speyside (and is home to Strathisla, reputedly the oldest distillery in Scotland). 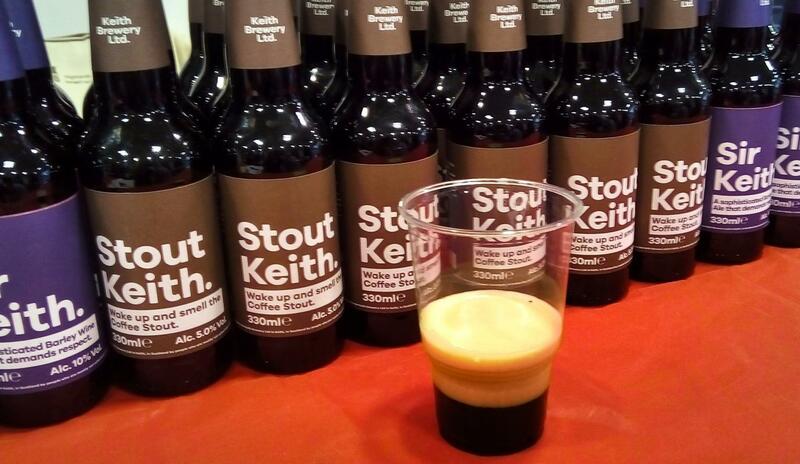 The Keith Brewery name is just a year old and its labelling is both tasteful and amusing. Everything is named Something Keith, for example, such as its barleywine (actually a Strong Scotch Ale) being Sir Keith and its lager being Larger Keith. Its brewkit is older and has ‘history’ though – it was formerly operated by Brewmeister, a poorly-executed attempt to out-do Brewdog in the shock and outrage stakes. Brewmeister’s clownish claims to have brewed the world’s strongest beer were ridiculed and largely disproved, and new investors took over. Alex was pouring Sir Keith and Stout Keith. Both were excellent, with the barleywine carrying its warming 10% ABV very smoothly. The stout, which is dosed with five litres of cold brewed coffee (from 5kg of coffee beans) per 2000-litre brew, was unsurprisingly coffee-roasty with a burnt bitterness and pleasing hints of old wine and tart currants. Her 10-barrel brewery has now been in production for a year. She started with four 10-barrel fermenters but when we spoke she had just ordered a 20 as well. Her beers are a hoppy lager that is unusually full-bodied – perhaps because it is lagered for five weeks, an easy-drinking porter, a wheat ale and an IPA. 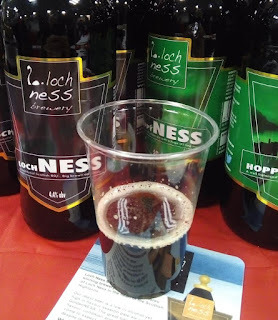 Last but not least, I stopped to chat with George Wotherspoon from the Loch Ness Brewery – besides Cairngorm, this was the only other brewery here that I already knew of, from meeting (and enjoying) their cask ales in London. As well as a core range of four, they do a wide range of seasonal beers, many of them available in both bottle and cask – and some cask-only. 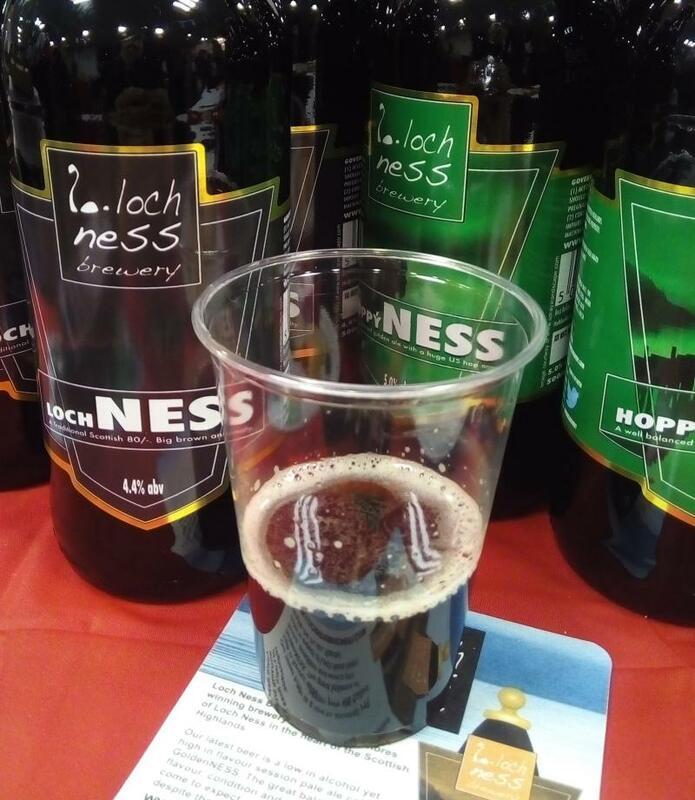 For sampling he'd brought along bottles of HoppyNess, a hop-dank and bitter-sweet pale ale which I see they've now rebranded as an American IPA, and LochNess, a malty Scotch ale that made me think more of a brown Porter. Overall, it was really interesting to see how responses to the craft beer opportunity can differ, yet all reflect a shared heritage – in this case, centuries of Scottish and British brewing. And of course there wasn't a bad beer in the bunch!